RMAs (Return Merchandise Authorizations) allow users to return inventory to vendors. Vendor POs must be enabled for this feature to work. Please contact Revel Support if you do not have access to the RMAs tab. In the Management Console ([yoursubdomain].revelup.com), go to the Inventory tab and then click the RMAs sub-tab. 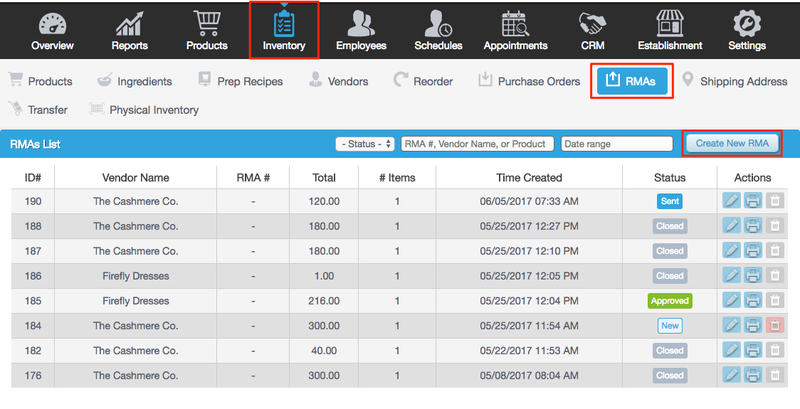 In the Create New RMA screen, fill out all required fields for Vendor Information, Shipping Information, and Contact Information. 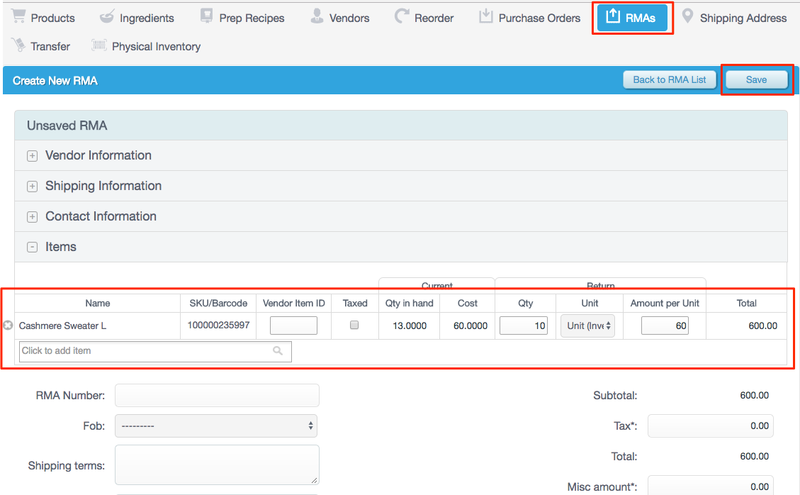 At the bottom of the screen, click the Click to Add Item box to start adding products to the RMA. In the drop-down, you will see all items that have been previously attached to this vendor. Click Show All Items to access all items in your database. To add an item to the RMA, click an item from the drop-down or search by Product Name, Barcode, or SKU. Once products are added to the RMA, enter the quantity to be returned under the QTY field. Vendor Item ID and Taxed are optional. These options are there for your own (or your vendor's) accounting and will have no effect on the return total. Enter the vendor cost per unit for the product under the Amount per Unit field. Click Back to RMA List to return to the main RMA screen. Once the vendor receives the RMA request and approves it, you can click the Approved button in the top right corner to show that it has been approved by your vendor. An Approve RMA? window will appear. Click Yes to mark the RMA as approved. The status of the RMA in the main RMA page will change from New to Approved. 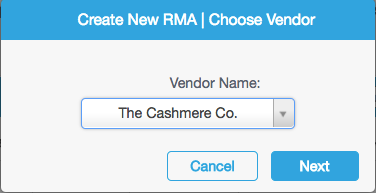 Once you have sent your merchandise back to the vendor, click the Sent button in the top right corner of the RMA. The status of the RMA in the main RMA page will change from Approved to Sent. As soon as an RMA is marked as Sent, the quantity of the items in the RMA will be deducted from your current on-hand inventory. You can email RMAs to the Vendor at completion. To enable this, go to Settings > Inventory settings > Enable Emailing RMAs. Your vendor must have an email setup under Vendor Information and then, when submitting an RMA, an email will be sent to the Vendor automatically.